Hi guys! I have a really fun and easy sewing project to share with you today, a super easy flutter sleeve dress tutorial! This adorable flutter dress pattern is something I’ve been afraid to start working on for ages! Why, you might wonder! Well, I’m not much of a sewer, I still have loads to learn about sewing and unfortunately not enough time. My little sewing machine is pretty rudimentary and I also have 2 left hands lol. But that doesn’t mean I shouldn’t try and make pretty stuff, even if I do fail ever once i a while (ok, pretty often!). But in my book, trying is more important than succeeding so I keep trying my luck. And this time I was pretty lucky as I did have great success with this flutter sleeve dress! 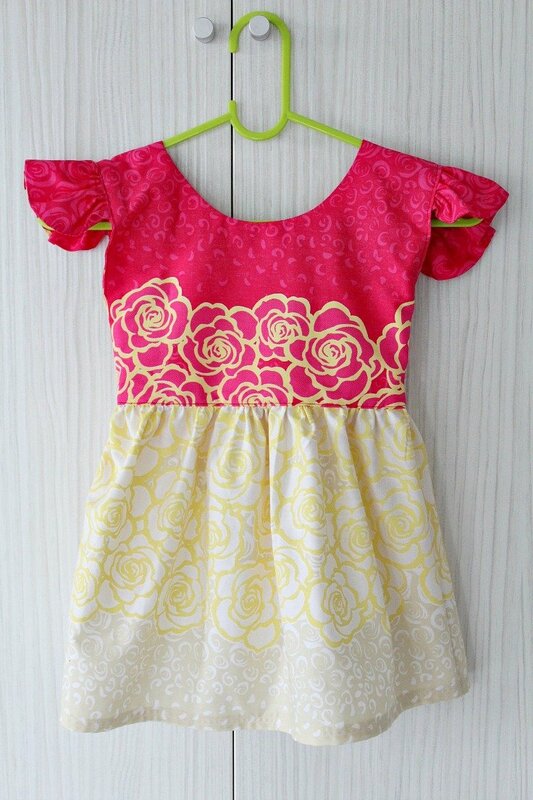 The result of a 3 hours work (yup, it took me that long lol) is a sweet and cute, colorful, comfortable flutter dress for a 4 years old little girl. And the best thing (that I’m very proud of) is that I did not use a pattern, I made my own! I was using just a few measurements, common sense and a lot of praying that I won’t mess it all up. I am completely in love with the flutter sleeve on this girls flutter sleeve dress, it’s so cute and girly! You are going to fall head over heels for each flutter sleeve dress that you’re gonna create! Cause you’re gonna want to make loads of these! 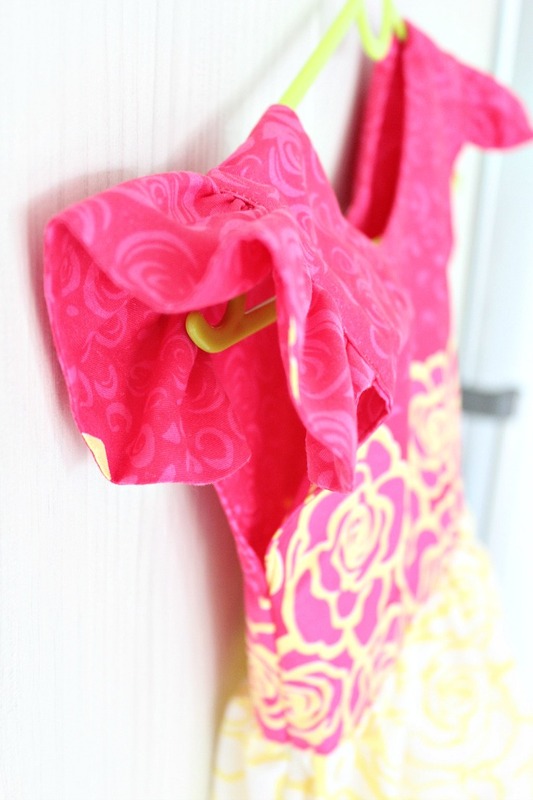 For this flutter sleeve dress tutorial I made the dress extremely simple. The instructions are meant to help any beginner sewers, who don’t know how to master drafting patterns, sewing intricate sleeves or a curved underarm. 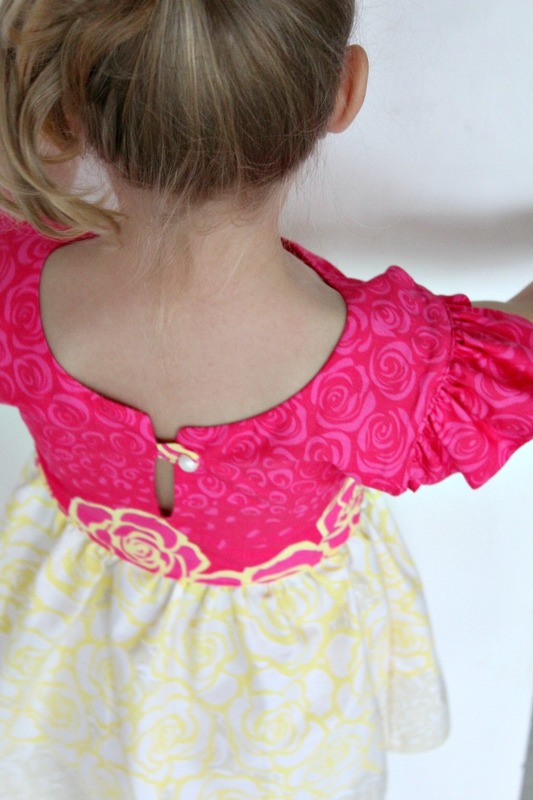 This flutter sleeve dress tutorial is also suitable for those who don’t own a serger and their sewing machine lacks a lot of options so they’re not able to serge the fabric. I don’t own a serger either and I’m supposed to use a zig-zag stitch with the overcasting foot I purchased. But it gives such an ugly finish I’d rather skip it and just fold the fabric in. I know, I’m such a rebel! lol For future though I think I’ll use pinking shears, I like pinked seams! 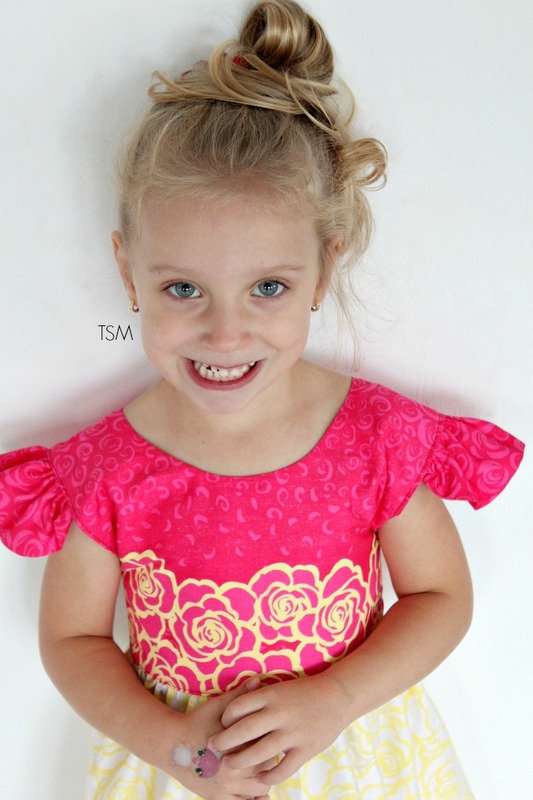 This flutter sleeve dress tutorial is for a 4 years old girl of about 40″ height, 80 lbs weight. I measured her shoulders to establish how wide I want the bodice to be, then I measured from shoulders to under chest, to establish the height in bodice. Then I measured from shoulders to where I wanted the dress to fall, to establish the length of the skirt. I approximated the neck line using an old dress and I left an opening in the back, closed with a button, to make sure her head fits through the neck line. 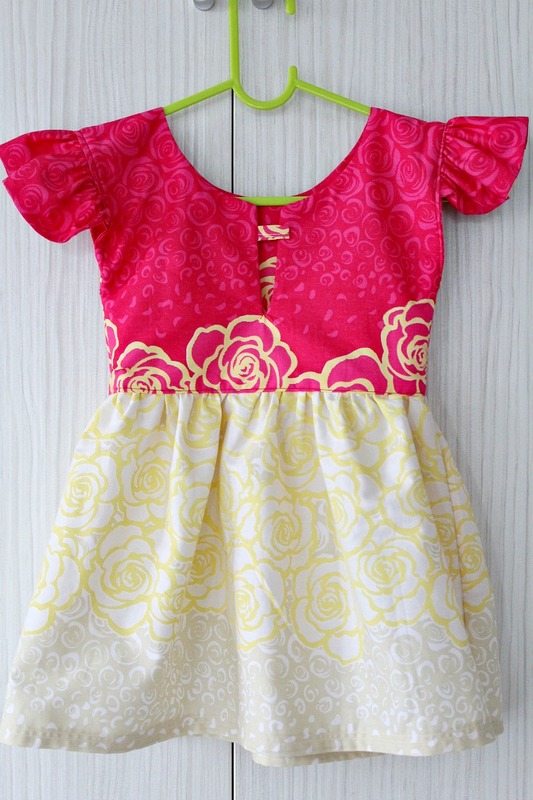 Can You please give me directions (pattern pieces) for this dress in size 6 mo. – 12 mo. ; 12 mo- 18 mo. ; 18 mo.- 24 mos. or size 2, please. I am used to sewing with commercial patterns and right now would be worried to cut material if I am not sure of the sizes, etc. I would appreciate any help you could give me. Thanks. Hi, Millie. My instructions are for a 4T dress. You can use my measurements as a starting point. To make your patterns smaller or larger, add or subtract about 1″ to/from the length and the width and only 1/2″ to/from neckline. Hope this helps. This is such a cute dress. I love the button closure on the back especially with the contrasting material. She makes a sweet model. Keep up the good work! So the sides are sewn together from under the arm down to the hem on each side and it just pulls over the head to put on and take off? Hi Linda. 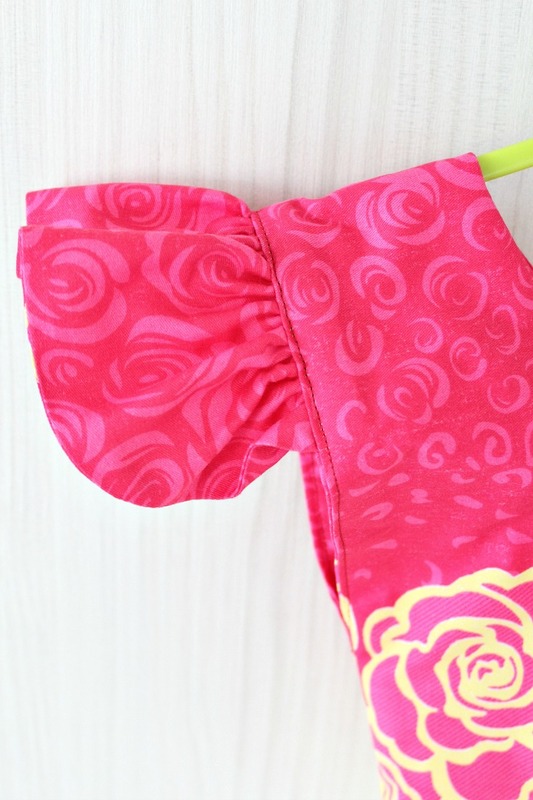 You’ll sew the sides together, starting from the hem up, but stopping about 3″ after you pass the bottom of the bodice. Then you can pull the dress over the head and take off with ease since you have the slit in the back of the bodice. I love this dress! I’ll be making one for my grand daughter! I also love the fabric but don’t know where to get it – what fabric is it and where is it stocked? I’m happy you figured it out! I love this dress, so cute! Hi i dont understand “Sew the fabrics together with a 0.50 cm = 1/8″ seam allowance, around the hole and line.” I tried this and i cant turn in side out if i sew the sew around the circle… can you explain? Hi Maeve. I’m so sorry you’re having troubles figuring this out. Trying to explain it better here: Make sure fabrics are right side together. Sew around the hole (neckline) and continue sewing around the slit. Then take the top fabric and push it inside the hole (neckline) until the fabrics are wrong side together. You’ll need to push the corners made by the slit with a blunt tool. Hope this helps. If not let me know and I’ll try to find another way to explain better. What a gorgeous little model! Thanks for an easy to follow tutorial with clear photos! About what size does this pattern make? What size does your little girl wear normally wear in dresses? Hi Alexis. My daughter now wears size 5 but she was a size 4 when I made the dress. A pretty little dress with those gorgeous flutter sleeves. What a beautiful little model! She looks so happy in her dress. I will be trying to make one for my daughter.